most conclusions about cosmic rays would be wrong. 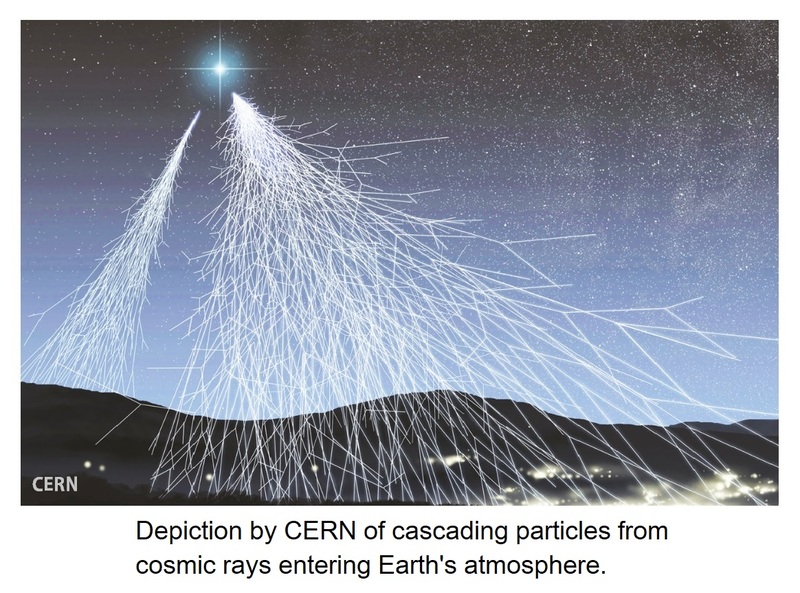 By definition, cosmic rays are made up of protons, elemental nuclei, and electrons, all moving rapidly through space, together with high energy gamma rays. Gamma rays are a type of electromagnetic radiation which travels at the speed of light, although electrons, in particular, can travel almost as fast. Cosmic rays must play an important role in the Universe but it is one that is only vaguely understood. Protons, electrons, and elemental nuclei in all their isotopic diversity carry an electric charge, which causes them to spiral around the force lines of Earth’s magnetic field as they approach Earth. The pattern of force lines is highly disordered, so one cannot tell where these cosmic rays originated. It was soon recognized that a type of ray that was electrically neutral would be easier to study. Gamma rays are electrically neutral so they were classified as cosmic rays. They consist of electromagnetic radiation with extremely short wavelengths and high penetrating power that is produced by atomic nuclei. Now, gamma rays could be studied and the findings applied to all the rest, even though they are different. The investigation is still difficult since gamma rays are absorbed by Earth’s atmosphere and can, therefore, be studied only in space. Size limitations for satellite-borne instruments have meant that most studies have been limited to lower energy gamma rays. The study of cosmic rays has proven perplexing because the fundamental character of galaxies and stars has not been recognized. It is claimed that stars including our Sun, are hot because of a thermonuclear reaction at their core (See #14: The Electric Sun), that stars do not interact with their surroundings, and that galaxies are held together by gravity. All this leaves astronomy only a little ahead of what was understood in the time of the Greek scholar Aristarchus of Samos, who died about 230 B.C. Impressive technology has been developed and applied but it has led to little understanding. The major result has been that a false ancient dogma has been replaced by a false modern one. Scientists assume that the abundance of elements that has been calculated from the spectra of stars, as well as analyses of some asteroids, represents their universal average abundance throughout the Universe. Similarly, they assume that the sources of cosmic rays must contain the same abundance of elements as that. Their assumptions persist as articles of faith, requiring that any discrepancies be explained away. Lithium, beryllium, and boron are the lightest elements after hydrogen and helium, having atomic weights (the number of protons in the nucleus) of 3, 4 and 5. They are comparatively rare on Earth but are abundant in cosmic rays. Cosmic rays are richer in other elements as well, especially as isotopes of elements occurring toward the lighter end of the periodic table, including fluorine, scandium, vanadium, and neon. The same might apply to heavier naturally occurring elements and their isotopes, but the procedures that have proven successful in identifying cosmic ray particles as heavy as iron, having atomic number 26, cannot be employed for the remainder which ranges up to uranium, having atomic number 92. Scientists did not expect enrichments in lithium, beryllium, and boron to occur in space, so they concluded that cosmic rays consisting of the nuclei of these elements, and others, must have resulted from the fragmentation of heavier elements that had collided with gas particles in space. The probability of various types of nuclear transformation in the lower energy levels had been established from particle accelerator experiments. By assuming that the source of the cosmic rays contains the universal average abundance of lithium, beryllium and boron nuclei, scientists were able to calculate the equivalent thickness of matter traversed by the cosmic rays in their journey that would result in the relative abundance of nuclei observed near Earth. By employing their estimate of the density of gas in interstellar space, this equivalent thickness was translated into the distance that the cosmic rays had traveled. Then, by applying their measured speed near Earth, the duration of their journey was calculated. Estimates of the lifetimes of cosmic rays vary from a few million to hundreds of millions of years. Remember, all this is dependent upon the assumed average abundance of elements such as lithium, beryllium, and boron throughout the Universe. I am proposing that isotopes of lithium, beryllium, and boron occurring as cosmic rays originate from nuclear activity on comets in the Oort Cloud rather than being derived from elements that formed immediately after the Big Bang. That considerable enrichment of these elements occurs on comets can be inferred from analyses of meteorites known as carbonaceous chondrites, which are considered here to be the burned-out remains of nucleate comets. Electrons produce nuclear activity on the Sun and the stars, while positively charged particles may result in nuclear transformations on nucleate comets. As nucleate comets and carbonaceous chondrite meteorites are further investigated, greater similarities between them are likely to be recognized. These could include micro-diamonds, the remains of hydrocarbons, amino acids, and even the imprint of bacteria. Astronomers assumed they could determine the composition of the stars from their spectra. Then they assumed their calculations of the abundance of elements in the stars are representative of their abundance throughout the Universe. Then they assumed the sources of cosmic rays do not contain a greater abundance than this. This guaranteed the rest of their conclusions would be wrong as well. The technology has been impressive but interpretation of the data has not. Most cosmic rays reaching Earth probably originated within our Solar Cell. Few originated beyond the Oort Cloud, and most are not millions, or hundreds of millions, of years old. The youngest cosmic rays from the Oort Cloud probably have an age of less than three years. Some charged particles reach Earth as part of the normal Solar Wind, while others accompany infrequent Solar Flares, but most of those that come from beyond the Solar System come from comets in the Oort Cloud. Every stellar cell generates cosmic rays and transfers energy and matter. Stars shine as a result, while without sufficient electrical energy to overcome the force of gravity, they would collapse — as does happen from time to time. If the manner by which our Sun receives its energy is by a continuous transfer of electrons from the Oort Cloud, then the electron flux within the Solar Cell far exceeds what was known before the space probe ‘Ulysses’ passed over the poles of our Sun. The problem of the unrecognized electrons was more real than the problem of missing neutrinos, or missing dark-matter, or missing dark-energy, all of which have been taken seriously by scientists. I had expected the electron flux into the Sun to be highest over the Sun’s Polar Regions where its magnetic field lines are most densely packed, and this was proven to be the case. The only space probe to have left the plane of the ecliptic was a joint venture between the National Aeronautics and Space Administration (NASA) and the European Space Agency (ESA). Ulysses was launched from the space shuttle Discovery in October 1990. It used the gravity field of Jupiter to leave the plane of the ecliptic and passed over the Sun’s South Polar Region from June to November 1994, and over its North Polar Region from June to September 1995. For a while, the possibility seemed to exist that the Ulysses mission would provide an understanding of the flow of energy within the Solar Cell. Ulysses recognized a pronounced latitudinal contrast between a fast wind (or current) over both of the Sun’s Polar Regions and a slower wind near the Heliospheric current sheet. In an early announcement, a spokesperson for NASA reported strong electric currents flowing ‘outward’ from the Polar South Pole. This was eventually corrected to read currents flowing ‘inward’. By applying their understanding of the physiology of stars, NASA scientists then predicted that the direction of these currents would reverse according to the 11 year Solar Cycle. A senior member of the Solar Group at JPL assured me (by personal e-mail) that by the time Ulysses passed over the North Pole, the Sun would be in its next cycle and the currents would then be flowing “outward” from the Sun. I disagreed with this and brought it to the attention of some NASA officials as well as some well-known astronomers, with no evident result. When electrons cross a magnetic field at close to the speed of light they generate radio waves having a characteristic polarization. This phenomenon is called synchrotron radiation, and when it is observed to occur in other stellar systems it is accepted as evidence that cosmic rays are active there as well. Most charged cosmic rays probably do not travel beyond their Oort Cloud because their driving force is determined by the electrical potential difference within their stellar cell. It follows that most synchrotron radiation in distant stellar cells is associated with cosmic rays that do not reach Earth. 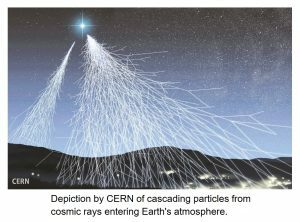 Most cosmic rays depart their source with comparatively low energy and are accelerated by the electromagnetic gradient of their surroundings. It is a difference in electric potentials existing between a stellar system and the Oort Cloud that provides the driving force for the acceleration of most cosmic ray particles. The study of cosmic rays is a challenging part of physics in which some inspired pioneering work was carried out. Some of this work included manned balloon flights with a gold leaf electrometer to investigate Earth’s electric charge, including a flight during a solar eclipse to rule out any effect of the Sun. Inevitably, an understanding of cosmic rays has been prevented by some of the same mislearned lessons that have corrupted other parts of astronomy. Radon is included here because it could benefit many people to know more about it. Radon has been identified by The U.S. Environmental Protection Agency as “the leading cause of lung cancer for non-smokers.” Since it is around eight times as dense as air, Radon will always settle in low areas, which is why test kits are set up in basements where possible. What makes Radon (Rn) so insidious is that it is a radioactive gas with an unusually short half-life, and its daughter products are radioactive solids with much longer half-lives. The result is that the gas is easily breathed in, and then breaks down into radioactive solid particles which stick to the lungs. Radon is produced by the radioactive decay of thorium and uranium, both of which have half-lives on the order of billions of years. It has no stable (non-radioactive) isotopes, and at least three dozen isotopes are known, which are the outcome of a variety of chemical pathways. Their half-lives vary from seconds to days. Some of their radioactive solid daughter products, however, have half-lives up to several months, which explains why Radon is so hazardous in an environment where it is being continuously replenished. Radon gas is invisible, odorless and tasteless, and passes up through the ground in areas underlain by granitic rocks, even at great depth. It may be swept through the soil by other gases, especially methane, a situation which is known to occur just before earthquakes. The greatest danger from Radon is in the basement and first floor of homes and other buildings, especially those constructed under outdated building codes. The only way to determine if Radon is present is to test for it. Many health and fire departments make test kits available. We are completely immersed in radiation our entire lives. Sunshine consists of radiation from infrared (long wave) to ultraviolet (shortwave). Everything in between is visible light. Beyond infrared waves, which measure up to a millimeter, is the Hertzian wave spectrum, which is assigned in bands for microwaves, radio, and television. At the extreme limit, maritime services employ wavelengths in the thousands of meters, and beyond that are wavelengths in the thousands of kilometers. In the other direction away from ultraviolet, and becoming progressively shorter, are x-rays and gamma rays. Other radiation consists of particles, including beta particles which are fast moving electrons, and alpha particles which are the same as the nuclei of helium atoms (2 protons + 2 neutrons). Most (as in 99%) of the nuclei occurring as cosmic radiation consist of the nuclei of well-known atoms. Most of these are protons (hydrogen nuclei) and alpha particles (helium nuclei), and only about 1% may be nuclei of more complex elements. The prevailing assumption still is that even the smallest dose of radiation involves a potential risk to human health. Up to 40 times what we receive naturally on an annual basis, however, can be tolerated with beneficial results being as likely as adverse ones. This may be because the body’s defense mechanisms against damage induced by radiation are stimulated by low levels of exposure. In Europe, as well as Montana, former uranium mines are used as health spas, which is the subject of ongoing studies. One benefit would be the opportunity to establish occupational exposure standards for workers in uranium mines. The largest study of all has involved survivors of both atomic bomb blasts in Japan. Most adult survivors have died so that mostly those who were very young at the time are being studied, and it is known that children are more susceptible to radiation. There are indications, however, that some who were adults at the time benefited from low doses to experience increased longevity. These results are complicated by deaths that may have resulted from a reduced immune response, and by the fact that the acquired dose must be estimated according to the location of the individual at the time of the blast. Here is a matter I have pondered: Why is iridium so common on the asteroids that are called carbonaceous chondrites? I believe that some of the lightest elements form on comets, and suspect that this could apply to heavier elements as well. Iridium has an atomic weight of 77, compared to Iron with an atomic weight of 26. Another interesting fact is that nickel has an atomic weight of 28, while the atomic weights of sodium (11) and chlorine (17) add up to 28. Does this mean anything? I don’t know, but if we should accept that the solar wind from stars reaches the Oort Cloud with sufficient force to result in nuclear transformations, then a source of the NaCl in our oceans is at least suggested. Comets are the most likely source of Earth’s oceans which included life in the form of bacteria, with hydrocarbons to provide sustenance, and viruses to exchange information between bacteria, leading to evolution. 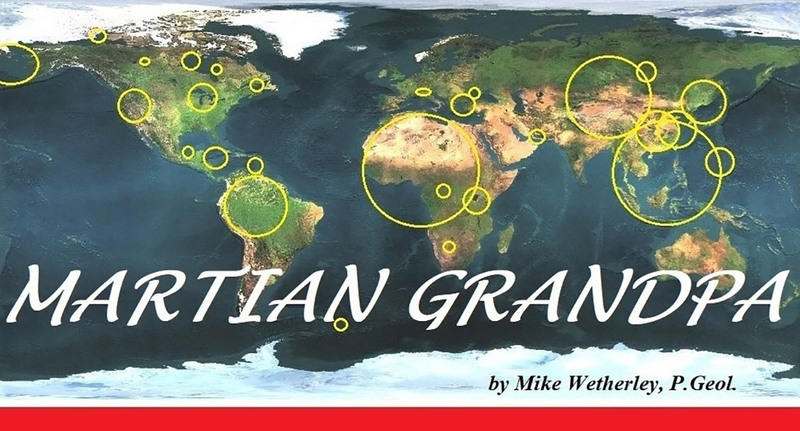 This has happened at least twice in our history, for a gift of the comets was received by Earth at whatever catastrophe ended the Proterozoic eon, after life on Earth was already well established. The ‘explosion’ of life in the early Cambrian period is referred to by paleontologists as the ‘biological big bang’. There is evidence indicating Earth received its ocean fully made, which means that other worlds which have retained an ocean may contain simple forms of life. This would include several icy moons of Jupiter and Saturn. What has made Earth so special is a favorable distance from the Sun, plus a relatively high frequency of catastrophe on a scale that has still been tolerable for the evolution of advanced life. In chapter #12 on Mars, I presented a visual comparison between the Deccan Traps of India and striations on the Martian moon Phobos, which many astronomers accept as having come from the Main Asteroid Belt. Basalt-flows within the Deccan Traps contain occasional breaks in deposition where sedimentary layers contain fossils. If the Lost Planet had an ocean when those lava flows formed, or an atmosphere to favor the development of paleosols (ancient soil horizons), and if it once occupied an orbit closer to the Sun, then fossils could possibly occur on Phobos as well. This would provide another identified source of fossils away from Earth, after Mars. The big difference is that any fossils on the Lost Planet more advanced than bacteria would be more likely to have evolved there from their original bacterial origins, while fossils of advanced life on Mars came from Earth. I hadn’t expected to end a section on Cosmic Rays writing about the distribution of life, but it does illustrate how everything in the Solar System is linked to everything else.